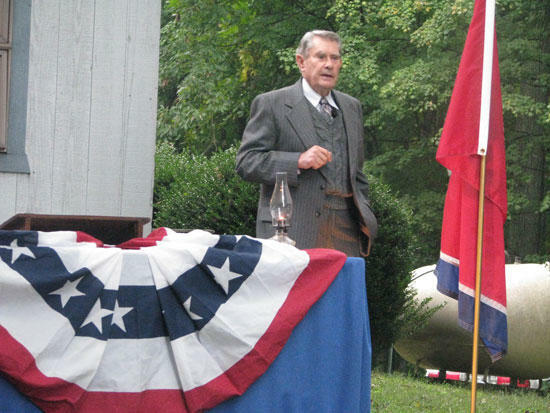 James Westerfield of Murfreesboro portraying James Edgar Evins for whom the park was named. Mr. Westerfield was personally selected by the granddaughters of Mr. Evins to play the role due to his similarity in appearance. Edgar Evins State Park on Center Hill Lake, between Smithville and Cookeville, will be hosting a 75th Anniversary Party for Tennessee State Parks (and 37th anniversary for Edgar Evins State Park) on Thursday, August 9th, beginning at 1:30 p.m. in the covered picnic shelters. Several invitations have been extended to State and local politicians as well as other people who have been instrumental in promoting and enhancing Edgar Evins State Park. The event is open to the public. Carl Halfacre, Manager of Edgar Evins State Park, writes “There will be guest speakers including Former State Senator Vernon Neal, who was instrumental in getting money appropriated to build a State Park on Center Hill in 1969, Deputy Commissioner Brock Hill, State Historian Ward Weems, State Senator Mae Beavers, State Representative Terri Lynn Weaver, Friends of Edgar Evins State Park President Fount Bertram (Bradyville, TN) and others. The Tennessee State Parks 75th anniversary traveling museum will be on display, Cornelia Overton great grand daughter of J. Edgar Evins will play the national anthem on her violin. Former employees will be recognized as well as other special visitors. Refreshments will be served after the ceremony.” The refreshments will include a special cake baked and decorated by Peggy Richardson of the Pure Bread Baking Company, Fairview, who is a member of Friends of Edgar Evins State Park. Other members will help host the event and assist in serving. In addition the traveling exhibit commemorating the 75th Anniversary of Tennessee State Parks will be featured at the celebration. The exhibit is enclosed in a colorful trailer emblazed with Tennessee State Park images and logos for the 75th Anniversary. The exhibit itself interprets the origins and heritage of the park system. Included in the exhibit is the Gold Medal Award for the nation’s best park system that was awarded to Tennessee a few years ago. This has not been out where Tennesseans could see it in the past. The exhibit covers the federal programs that helped bring about not only Tennessee State Parks but most all state park systems. Programs such as the Civilian Conservation Corps, the Works Progress Administration, and elements of the Department of Agriculture and the Department of the Interior set about obtaining land, building infrastructure, and creating an environment for state park movements to come into being and flourish. The National Park Service played a large role in planning and organizing the overall effort and the individual parcels that were destined to become state parks. States, though, needed to commit to taking on the land ownership and responsibility for resources, land bases, infrastructure, and long-term management and stewardship of these properties. Tennessee's Department of Conservation (now Environment and Conservation) and its Division of State Parks filled this need in Tennessee when the Origin Act for these organizations and their responsibilities was passed on 21 May, 1937 - 75 years ago. Tennessee stepped up at an early time to take on its responsibilities in providing protection for its natural, cultural, and outdoor recreation landbases and resources. Tennessee State Parks has been serving Tennesseans and providing touring destinations for 75 years now. The system represents Tennessee's heritage in the landscape and reflects the diversity of Tennessee's geologic and ecological regions and the diversities of the stories of Tennesseans throughout the states over 200 years of history as well as its prehistory for millennia. The Tennessee State Park system provides diverse types of experiences based on the state's range of natural and cultural resources and the appropriate level of outdoor recreational opportunity for each resource base. It is a healthy system of diverse parts and diverse opportunities. Each park tells its part of the story of Tennessee and expresses its unique nature that gives all our sites their own spirit of place. The system continues to offer new opportunities and the 54th park opened at Cummins Falls recently. When the park system was 30 years old, it had 26 parks. The system has grown remarkably since then. With assistance from the Land and Water Conservation Fund, the size of the system doubled over the next three decades. Most Tennesseans now have not only a park within an hour, but in most cases more than one type of park within an hour. That is truly something to celebrate and to get out and enjoy in our park system's 75th year.